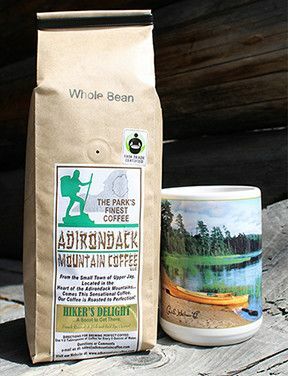 The Park's finest coffee from the folks at Adirondack Mountain Coffee roasted locally in Upper Jay, NY. Hiker's Delight is a rich and bold eye opening French Roast... A Boost to Get There! Fair Trade Certified. View more products from Adirondak Mountain Coffee at: adkmountaincoffee.com. Sand Lake mug sold separately and available in the Bottles & Mugs section.